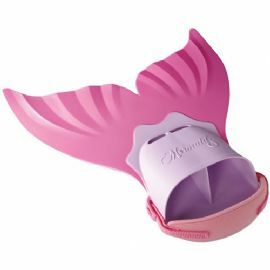 These kids Finis Mermaid Monofins are made from lightweight soft plastic designed for children ages 12 and under. They feature and easy release adjustable foot strap. The mini-mono fins were originally designed for private pool use. However, since their launch in the USA many swim teachers and coaches have adopted them as a great way to teach kids butterfly leg kick. These monofins are also excellent for improving co-ordination. Kids size 12 to 6. Made from lightweight soft plastic. Great way to teach kids butterfly leg kick.